Dolphins have a “signature whistle” which allows others to recognize them. There are many accounts of dolphins helping humans and even whales. Dolphins live in groups and cooperate with each other to get food and raise offspring, called calves. Dolphins play-fight with each other and also play with seaweed. They have also been known to play with other animals such as dogs. Dolphins sleep by resting one side of the brain at a time. This allows them to continue rising to the surface for air and to keep an eye open to watch out for predators. 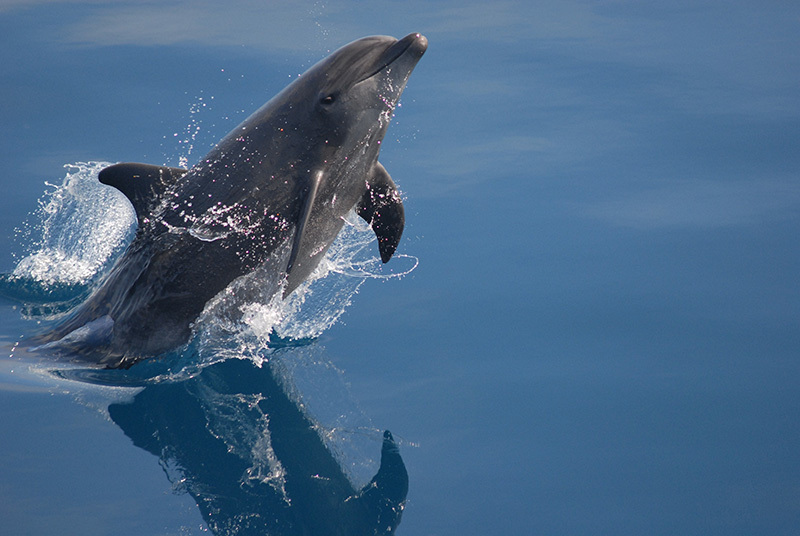 Dolphins use echolocation to find food and navigate. This is a natural version of radar. Dolphins can jump as high as 20 feet out of the water. The “killer whale”, or Orca, is actually a dolphin.